Spider mites are tiny and difficult to see with the naked eye. A convenient detection technique is to hold a sheet of white paper under a branch and then shake or tap the branch against the paper. The mites, if present, will show up as tiny, slow-moving specks on the paper. Adults and nymphs are white with two, more or less dark, greenish spots (summer coloration). The twospotted spider mite is a “warm season” mite favored by hot, dry weather and drought conditions. This mite has been reported from over 180 different plants including field crops, lawn, garden and landscape plants, houseplants and weeds. Mites become active in April and May and are active the rest of the summer. Severe damage usually appears in late summer after a period of hot, dry weather. Mites feed externally on plant foliage. They use piercing-sucking mouthparts to puncture the plant tissue and feed on the liquid within the cells. Feeding injury causes the foliage to be discolored with very tiny yellowish-green speckles. Severe damage causes “bronzing” or "bleaching" and damaged leaves may drop off the plant. Close examination of infested foliage may reveal very fine webbing on the stems at the base of the needles. 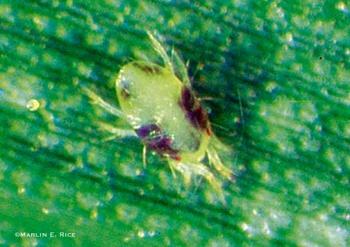 Several miticides (pesticides that control mites) are available for mite control. Spraying to reduce mite numbers is advised when plants show the characteristic speckling and the white sheet of paper technique turns up a large number of mites (a dozen or more on each sheet). Sprays available to homeowners include insecticidal soap, horticulture oil (summer rate), malathion, permethrin, and others available at your garden supply store. Soap and oil sprays have no residual activity and only control mites and insects that are contacted directly. Thorough spraying is important for control. On smaller trees and shrubs it may be possible to reduce light mite populations with periodic “hosings.” Use the garden hose to apply a forceful stream of water to dislodge mites from an infested plant. Repeat 3 or 4 times on consecutive days. Keep plants watered and mulched to promote health and vigor and to reduce the impact of mite feeding.